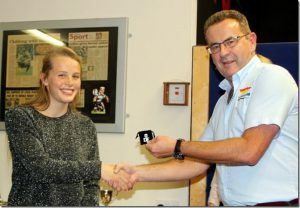 Saunton Sands Surflifesaving Club held its Presentation Evening on 5th October. Each section presented awards to worthy recipients. Prizes included the Most Smiley Award for the Sharks age gorup – 5 to 8 years old – through to the club’s Annual Life Saver Award awarded to Stuart Pitches for his contribution to the club as Training Officer and his commitment to providing water cover and Lifeguard patrols. The evening’s presentations also included Duke of Edinburgh Award certificates. 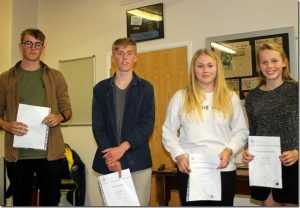 Five Silver Award certificates were presented to Junior Surflifesaving members, Finn Whittley, John Morgan, Emma Featherstone, Laura Fraser-Smith and Gus Dunbavin. Paul Coles, Surf Life Saving GB Trustee, then presented two Gold Award Certificates to Laura Fraser-Smith and John Morgan. Paul recognised the considerable effort and commitment required to complete the Gold Awards and stated that Laura and John were the first Gold Awarders for SLSGB, which first offered the award scheme in 2016. Laura Fraser-Smith completed her DofE Residential section by undertaking a week’s intensive Chemistry in Liverpool’s Science Park. John became a conservationist in the Peak District for a week, earning himself the John Muir Award for his hard work in clearing ditches and rhododendrons and carrying out vital maintenance tasks for this popular wild destination for walkers. Laura trained for and conquered the 55 mile course of the Ten Tors challenge for her Physical section. John has played indoor volleyball for the South West team and latterly for England’s National team. 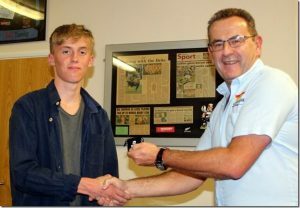 Both worthy Gold Awarders have juggled studying for GSCEs, A1 and a Level 3 BTEC with the requirements of the scheme. They also needed to volunteer for 12 months to assist an organisation or group. Laura chose to help set up and then run the Sea Moor Explore Group in North Devon. John has provided weekly maintenance assistance for the Forest School at Pathfield School in Barnstaple.